Lambs? 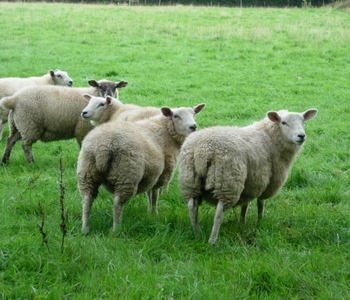 Or sheep? Only their mothers know for sure. Or maybe they're just lambs in sheep's clothing. Anyway, they live in the Chilterns near a hamlet called The Lee. We surprised them on our walk. We later walked through a field of sheep, and I leashed the dog, though she could care less about chasing the lambs. She does enjoy the occasional tasty sheep dropping, though. Please remember that 34 senators voted against the bill that allows torture and rescinds habeas corpus. I have no idea what percentage of the American people supported the bill (or even knew it was being voted on) but let me explain: Many people in America watch a show called "24" where terrorist bad guys are out to get the good guy(s), played by blond-haired Kiefer Sutherland. The only way to stop them, when they have their greasy little hands on the trigger of certain world destruction, is to torture them. (At least I think it goes something like this; I've never actually watched the show.) They think real life is this simple, this black and white. It's—almost—kind of sweet, this child-like belief in the greater power of, well, power. They also watch a misleading cable channel called Fox News, which has nothing to do with foxes or indeed news, and are therefore brainwashed. Hopefully, these Americans don't travel much abroad. Have you ever seen anything cuter? I thought not. This was seriously cute too. 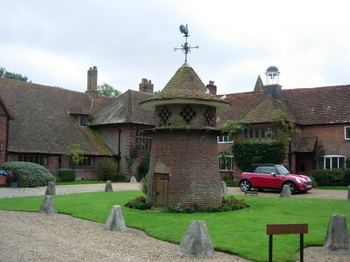 No, not the little dovecote with the gnome-sized door and the two doves on top. I'm talking about the cute red mini in the background. It turns out the United States has led the way on trans-fat awareness and labeling, and consequently manufacturers have found acceptable substitutes (encouraged by some well-placed lawsuits). Britain is catching up, however, which is good news for me, since I don't eat butter. (I, too, can spot a cookie or scone made with butter: it tastes rancid.) I still find far too many trans-fats on my labels, including some foods which are also sold in their trans-fat free form in the U.S. I'm considering phoning the companies and asking how to get my money back, since the products are so dangerous. I'll see what they say. If it's September, it must be time for soup. There's been nary a nip in the air, but I had a hankering for soup the other day. 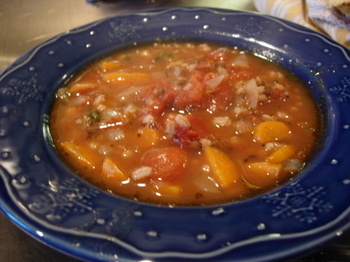 So I used the excuse of Hurricane Gordon, lashing us with raindrops, to make a pot of lentil and barley soup. Soup, though, is surprisingly forgiving: if the carrots and onions weren't picked yesterday, you'll never know it once they've simmered in soup for an hour. 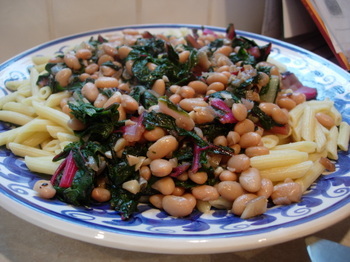 The next day I heated up the leftovers, but added some fresh spinach I'd picked up at the farmers' market. Eat your heart out, America. Spinach is still on my menu. I also made some bread, which was similar to the Bread Rolls with Sun-dried Tomatoes and Walnuts from And They Cook Too. (Have you bought your copy yet?) Again, when life presents tough circumstances, baking bread is always a good response. Nick of What You Can Get Away With has started on a journey from John O'Groats to Lands End, all on foot. He actually began in July, when I wasn't paying attention, and is just now down to the southern end of England. For those of you who aren't familiar with the geography of Britain, John O'Groats is generally considered the northerly most spot on the island, while Lands End in Cornwall is southwestern-most. Why is he walking more than 500 miles (875, actually)? To raise money for Brain Research Trust. BRT funds research into various neurological disorders, including Huntington's Disease, Parkinsons, brain tumors, and MS. Chances are you know someone suffering from one of these diseases. So did Nick. His brother died last October of a brain tumor. You can read about how he was inspired to walk the journey here. I only walked 5 miles today, and I'm beat. Nick, however, is still going strong, even at the end of his journey. I've enjoyed looking through his photos, here. Some of them look very familiar! If you've enjoyed them too, you can donate to BRT here and help Nick make his goal of £5000. Today was Eighties Day at my daughter's school. So last night she consulted her parents, who were drug-free and fairly cognizant for most of the decade, for advice. We looked at each other, looked down at what we were wearing, and said "What's wrong with this?" So then she consulted my old college yearbooks, bona fide documents of the period. "Ewww! I'm not wearing THAT!" she exclaimed upon seeing co-eds in bow ties and button down shirts. It's a good thing she doesn't get a grade on things like this; her parents, both of whom graduated with honors, could never guide her through the intricacies of clothing selection. (Though I must say we excel at calculus and Iran Crisis Reports.) Fortunately, her skills exceeded ours by the time she was four, when she insisted on wearing red patent boots with her green corduroy dress. A stunning ensemble, the preschoolers agreed. When I want to be really daring, I pair a brown shirt with the black sweater. Nothing says cutting edge quite like brown on black. Nor is the man of the house a slave to fashion. Torn t-shirts—including the same one, I'm sure, he was wearing in that yearbook—are his casual attire, and for work he wears whatever's on sale at BrooksBrothers.com. I noticed a daring yellow tie they sent still in its plastic wrap—it might clash with khaki twill; best not go there. If tomorrow is Pajama Day, we should be much more helpful. She can borrow my Dean for America t-shirt. And the black sweater, of course. Normally I don't pay too much attention to state races. I've lived in too many states to take the time to learn who the players are and what the issues are, preferring to spend my energy and money on federal races. But there's one race in New Mexico that is worth paying attention to, especially since I'm becoming increasingly worried about what is being done to our environment. 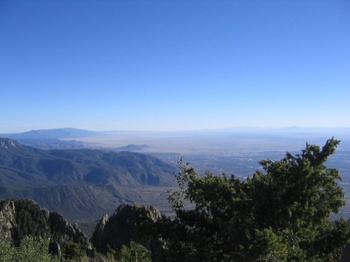 As one of the largest states in the union, and one of the most pristine, New Mexico is the frontline battleground when it comes to preserving America's natural landscape—whoever wrote "purple mountain's majesty" had New Mexico in mind. The State Land Commission is an important state office, wielding a huge impact on environmental issues in the State of New Mexico. The office oversees 9 million acres of land and adjoining mineral rights—you can see where this is going, right? Another issue near and dear to my heart: I have heard rumors that Baca's campaign has gone to the dogs—even more reason to vote for him, in my book. I did know he was behind Albuquerque's first dog park, but I didn't realize he helped stop the slaughter of wild Mustangs while at BLM and has helped protect animals from the erroneously named "Wildlife Protection Services," whose job it is to kill wildlife on federal lands, often in unspeakably cruel ways. Baca also wants to invest in alternative energy, now, while state oil and gas revenues are high, instead of later, when we desperately will need an alternative source of energy. (New Mexico is an excellent location for both solar and wind projects.) He also plans to protect the state's increasingly scarce water supplies, something that little thought has gone into despite the fact New Mexico is a fast growing state that happens to be in a desert. You can check out his website here, read his blog here, and contribute to his campaign here. If you want to learn more, read this Albuquerque Journal profile of both candidates. Why Don't We Waterboard Tony Soprano? If torturing suspected terrorists is okay, then is torturing suspected drug kingpins? How about suspected mobsters? Suspected gang bangers? Suspected corporate crooks? Suspected cultists? Suspected anti-abortion activists? Suspected agri-business spinach polluters? Surely all these suspects potentially have information that could save lives. This is one slippery slope that ain't going nowhere but down. And then there was this admonition by Tom Burke, of Imperial College London: "Don't be under 40. If we fail to address this problem, my advice to people is not to be under 40." Or just watch the first few minutes for no other reason than to see the lovely wisteria blooming in Wales in May. We're having a warm September, well on its way to being the warmest ever. And today we got the remnants of Hurricane Gordon, in the form of rain all day. A hurricane. In the British Isles. Finally, the movie An Inconvenient Truth opened here last week, but unfortunately it's only playing in a few cinemas, mostly in London. I was hoping it would show at my local cinema, which is a 15-minute walk from here. It really is an inconvenient truth, isn't it? More bad news, even closer to home: They're cutting down the willow trees in my back garden. They are apparently causing subsidence, interfering with the foundation of the house. I'm the one who alerted the estate agent that the ground was sinking in places, so I've no one to blame but myself. And a two year drought, that's dried out the clay soil. I'm really going to miss those trees. So is the dog. It is not the rain that's getting me down. "May I have a drink, please?" On our walk the other day around Watlington, we passed by a handsome herd of cows, enjoying the sun on the hillside. 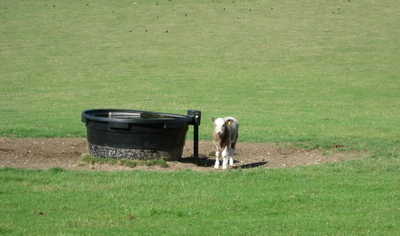 This calf stared plaintively (actually, there is no other way for calves to stare) at me as we walked by. He reminded me of a kindergartner at the water fountain. Much of the action in a new movie starring Helen Mirren took place here. 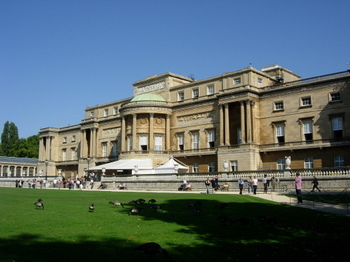 Another hint: It is one of the most popular tourist attractions in London. Obscure hint: There used to be a plantation of mulberry trees on this site, for the purpose of feeding silkworms. And a chap named Lord Goring lived here. That's positively all the hints we shall give. UPDATE: I see no one has ventured a guess. We are not amused. Have You Heard About the Flake Who Wants to Stop Heather Wilson? I've long had my differences with Heather Wilson, Republican congresswoman from New Mexico, and now her Republican colleague Jeff Flake from Arizona is also at odds with her. Although Heather Wilson campaigns as a moderate Republican, she's anything but. On the other hand, Jeff Flake is a true moderate Republican. In fact, I've written admiringly about him before. (And no, it's not just because he's a distant —very distant—relation.) He's a tough fiscal conservative, a rare breed in today's congress. He's also a man of common sense (as are all Flakes, I've found). So why's he upset with Wilson? He doesn't like the bill she introduced which would allow the White House to continue its civilian eavesdropping program with little oversight from Congress. Rep. Jeff Flake (R-Ariz.), who is spearheading GOP committee movement against Wilson’s bill, said the measure fails to create a solid system for TSP and would instead establish a passive, ad hoc response to terrorist attacks, rather than a steady program with legislative oversight under FISA. Flake said this approach both threatens the stability of intelligence gathering and increases the likelihood of civil liberties abuse. It's no surprise Heather Wilson wants to give Bush's illegal surveillance program the stamp of congressional approval. After all, she's known for her support of Bush's agenda, despite the fact she, like other Republicans, is hesitant to be seen with him these days. They read polls and they know which way the wind is blowing. I hope it's blowing in a change for New Mexico, in the form of Patricia Madrid. Because we can't always depend on Republicans like Jeff Flake to stand up to the Bush administration. Remember, a Democratic majority begins at home—vote on November 7 for a Democrat in your district. This one's so easy I hate to bother posting a recipe. I mean, you could do this one in your sleep. But with spinach off the menu for my U.S. readers, I think it's time for some opportunistic chard blogging. Chard is upscale spinach, greens you can serve your city slicker friends who'd turn up their noses at collards or mustard greens. It's also multicultural, coming in all colors of the rainbow as well as plain old Swiss. I picked up a bunch of mixed chard at the opening of the farmer's market in my village the other day. It kept in the fridge for several days, since I'd also bought other veggies that had more pressing needs. And unlike spinach, a little goes a long way. Six leaves of chard made plenty for my small family. It takes a bit longer than spinach to cook, but not as long as other greens. This is a dish that can be on the table in 30 minutes flat. Serve it with a loaf of Italian ciabatta bread, some wine, and pretend you went to a lot of trouble. Food news you can use. Or not. Ever heard of a vegetarian crocodile? I should have posted this one sooner: Buy lentils now, before the shortage reaches your supermarket. Nutritional data on mushrooms has been updated. Turns out most nutrients are retained after cooking. This only reinforces my belief that raw food is yucky. Of course then there is this: Salad eaters have higher levels of key nutrients. Okay, then, eat some spinach. I dare you. Huntington's Disease is a neuro-degenerative disease similar to Alzheimer's which strikes people in the prime of their lives. It's caused by a dominant gene and there's no cure and no effective treatment. There was a time (pre-Google) when I poured over the emerging World Wide Web to find news just like this: Green tea may slow Huntington's Disease. And there are lots more reasons to drink tea. Somewhat surprisingly, English tea companies appear to be the slowest to catch on to the trend of fine tea in tea bags. The English often drink tea with milk and sugar, so they like it dark and strong, just the way cheap tea bags make it. “The English consumer is less adventurous than the American,” Mr. Cheetham said. Which explains why I don't care for the typical English cup of tea. I prefer green tea, no milk, which is not available everywhere here, including at my local coffee shop. I do ask every time, but so far they haven't gotten the hint. Finally, a vegan artist needs your help! Veronica Ibarra is collecting grocery receipts for an art project she's planning. Here's a bit of info. She'll need lots—LOTS—of grocery receipts, non-vegan as well as vegan. I'm sending her mine, which means she'll know just how much chocolate I consume. Stop This Madness! Stop It Right Now! Texas energy giant TXU wants to put 10 million Cadillac Escalades on the road! Remember a few days ago I wrote about the plans to build more coal powered energy plants in Texas, already the number one polluter? Now there's a website that aims to stop this madness. They provide a helpful translation of "78 million tons of carbon dioxide released into the atmosphere each year," putting it into terms you can understand. Check it out, email Gov. Rick Perry, make all the noise you can. Heck, boycott Texas; can't hurt. And if you need a reason, read the Gaia theory's creator James Lovelock's prediction for the future of planet Earth. Unless you own property in Alaska you are pretty much doomed. It's not nice to fool Mother Earth. A feature in the Guardian's Weekend magazine showed then and now photos of residents of Oxford, Iowa, taken in 1984 and 2005. Each person wrote a bit about themselves, and taken together, it presents a portrait of Americans many Brits are unfamiliar with. These aren't the Americans who travel abroad, apologizing for their president and pretending to be Canadians. These bible-reading small town Americans portrayed in the feature are the ribcage of the country, its janitors, truck drivers, secretaries and school teachers. It all rang true for me, even though I was born in a small town at the other end of the Mississippi River. I'm 23, but I have an 18-year-old stepson and a 13-year-old stepdaughter. I met my wife at a gas station, and ran into her again at a bar in North Liberty. We have a baby on the way—my wife came up with the name Gaige. I'm going to call him Twelve, as in twelve-gauge. I've never talked to a black person in my life. I don't have any trust with them. There's two kinds of blacks: there's the no-good kind and there's the white black. I don't agree with how they talk, the jibber-jabber. I don't like the baggy, hip-hop clothes. I'm a Wrangler kind of guy. I don't like city slickers. How could someone in today's America, the melting pot of the world, say something like this? The easy answer is that he's mentally disturbed. The more difficult question is how does anyone live 23 years without talking to a person of another race. Is small-town Iowa that different from anywhere else in the U.S.? Is it still this easy to segregate oneself? In another portrait, one of the last surviving liberators of the Buchenwald concentration camp writes that he still has horrible dreams and attends therapy sessions. He says if he could do it all over again, he'd choose to be a psychologist. I wish he had been; there's a baby known as Twelve Gauge who'll need his help one day. You can read about the project and see some of the portraits here. I don't think I've explained the concept of "a walk" before; that is, exactly what British people mean when they say they're going for a walk. Chances are they don't intend a leisurely stroll around the 'hood. To the English, fond of understatement, a walk is what an American, fond of overstatement, would call a hike. Walks are big business here. There are Ramblers Associations (a walk is also called a ramble, by more serious walkers) and websites aimed at devotees. Bookstores have shelves of books dedicated to circular walks in every region of the English countryside. 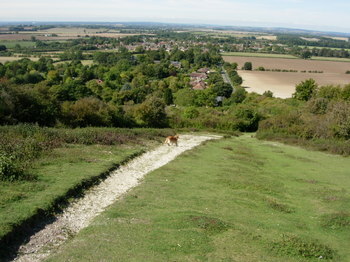 I have several books featuring walks around the Chilterns, and no two are the same. The hardest part (other than climbing the steep Chiltern hills) is deciding which one to take on a beautiful September Sunday. The walks typically start at a pub or public carpark, and continue through woods, over pastures, along rivers, down ancient "roads", up and down hills, and across village lanes—all in one walk. With most of Britain's land open by law to public access, there are very few places that aren't networked by well-marked public footpaths. The walks are almost always dog friendly, but you are expected to keep your dog under control, and on a lead when near livestock, especially during lambing season. 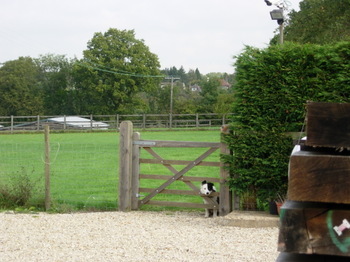 The kissing gates and stiles are designed with dogs in mind—there is always room for even a retriever to scoot underneath. 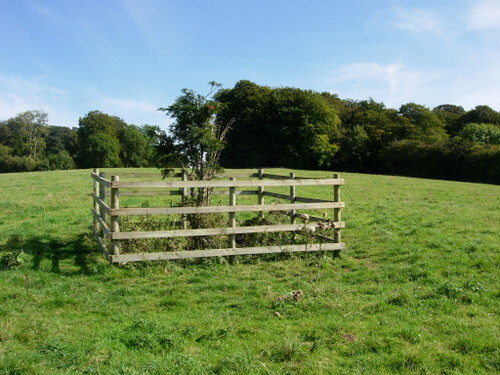 Only once have I had to heave her over a stile that was missing a "portcullis" entry for dogs. An average walk is from 4-10 miles in length, but one must make allowances for the inevitable missteps. The directions, which seem so clear at first glance, often make no sense at all when the countryside looms: is this the clearing referred to, or is it further down? And what's a copse anyway? On the walk we took today, near Watlington, the directions said "with the White Mark to the left, follow the trail down the hill". Only problem, we didn't see the White Mark, or in fact know what the White Mark was (having failed to do the proper research beforehand). So we wandered around a bit, following other trails, until we backtracked and saw an unmistakable chalk carving in the hillside. We managed to find the section of the walk that went along the Icknield Way—after all, the oldest path in Britain is hard to miss. But we made a mistake again when we went right instead of left on path W6. No problem; this way allowed us to walk near a lovely herd of cows. We went down One Tree Hill, named for the ancient yew tree that once stood all alone on the hillside. Now there's a replacement yew, protected by a fence. The views were spectacular, just like the description of the walk said. Rolling green hills in every direction, the village of Watlington nestled below as if posing for a postcard. In fact, the views are so great the escarpment was once used for a line of beacons to warn of the approaching Spanish armada! For more photos, go here. And if you're interested in another walk that we took along the Icknield Way, go here to read about our hike last year along Dunstable Downs. See how in that last sentence I typed "hike"? I am, after all, still an American fond of overstatement. I know you're not supposed to pick favorites among the herd, for fear of fostering resentment, but this cow, who I've named Donnatella after my favorite West Wing character, has a special place in my heart. She's always the first to come to the fence when I'm in the garden, looking over with a patient look in her brown googly eyes. When I arrived home from Dublin, it wasn't long before the cows gathered at the back fence. My husband thinks they heard my voice. I must admit we have developed a bond. 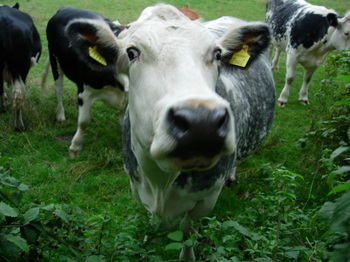 Really, could you resist a cow who looks at you like this?